Among the huge variety of modern video game genres exists a subset of games that offer players the chance to use real-world collectibles to accrue a variety of in-game benefits. These "toys-to-life" titles engage players in both the analog world and the digital world, offering intangible rewards for possession of tangible objects. Nintendo's various amiibo align with this notion, as does the now-defunct line of Disney Infinity products. Before recently, Ubisoft didn't have a dog in the fight — but now they do. Starlink: Battle for Atlas is Ubisoft's push into the toys-to-life field, and though the developer's spin on the genre is certainly admirable, the physical side of the experience feels lackluster when compared to the digital. 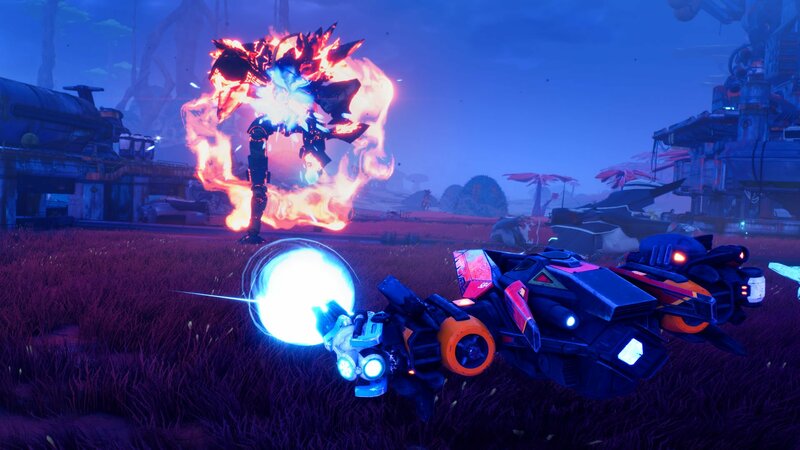 The core experience of Starlink: Battle for Atlas could be likened to the looter shooter genre. Players choose their hero and their ship, and can fly around planets running missions for various allies or factions, taking out progressively stronger enemy forces, and acquiring different upgrades, only to jump back into more plot-oriented quests whenever they like. It's a familiar scheme for sure, but Starlink's spacecraft-focused foundation makes the gameplay all the more interesting. On the planet's surface, ships hover a short distance above the ground, and players can circle, strafe, or even jump if desired. At any time, players can press and hold a button to fly out into space, where the action becomes more free-roaming. A total of seven different planets are available to explore, each as gorgeous as it is vast, and after being discovered, players can travel between any them at will. Players can expect to take down more than a few hulking baddies. There are several different types of missions to engage in, though the variety is admittedly lacking. Most quests involve tracking down or placing various items, clearing out swarms of enemies to reclaim an area or base, or defending hotspots from swarms of foes while a procedure is being completed. There are side quests all over: players can call up new missions at any point with the push of a button, identify unique fauna, seek out specific materials, or simply explore the map. There are also battles with some very large creatures, though these are few and relatively far between. Ubisoft deserves a special commendation for making Starlink's basic gameplay feel so good. To be honest, I haven't played a game where flying and shooting felt this polished since the release of Star Fox 64 back in 1997. Taking off from the planet's surface, jetting through the atmosphere and out into space, just feels so right. Landing on a new planet and immediately wiping out colonies of Legion baddies is similarly smooth, and I never once felt like I wasn't working toward some sort of goal. Even better, this is a game that can be played for a few minutes or a few hours, and that's something that gamers of any age can appreciate. 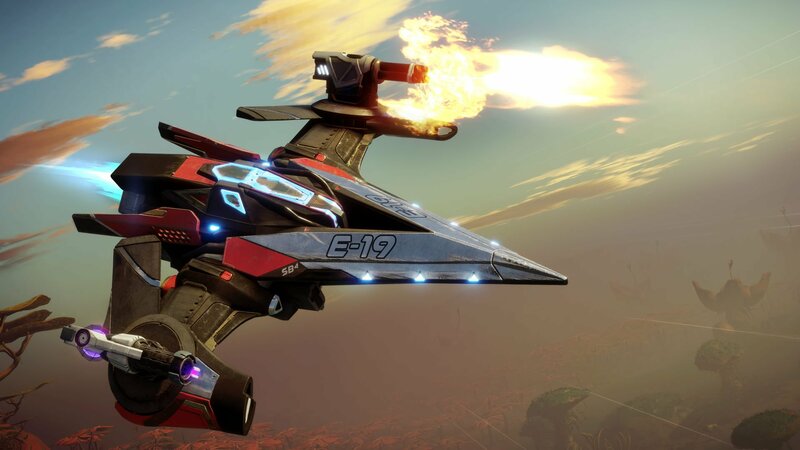 Among the biggest draws to Starlink: Battle for Atlas are the ships themselves, which offer up a level of customization that is borderline overwhelming. Ships can be hot-swapped at any given time, wings can be applied or even stacked at will, and weapons can be installed or modified with only a few button presses (or by making use of Starlink's physical toys — more on that later). The degree of customization is so vast that players can have four different wings on the same ship, aligned any way they please, with each wing providing a different bonus to attributes like speed or maneuverability. Though only two weapons can be installed at any time, players can apply them to whichever side of the ship they choose, and even place them so they fire backward if they like. 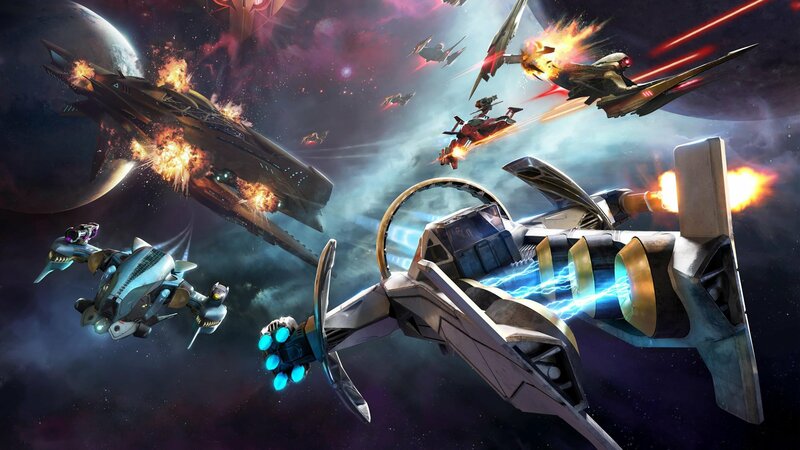 The Lance is among Starlink's most agile ships. Customization only gets deeper thanks to the availability of Mods. Found hidden all over planets, dropped by enemies, or even given as quest rewards, Mods allow the player to fine-tune their weapons, their ships, and even their mothership, offering upgrades that trickle all the way down to planetary outposts. Armor Mods, Weapon Mods, Booster Mods, Core Mods, the list goes on and on, and only a few short hours into the game, players even can start using their weaker Mods to craft more powerful ones. All of these elements make for an experience that is, at least at first, daunting. Ships and wings that feel right for exploration might not be the best choice for combat, and weapons that are familiar or convenient to the player may be ill-suited against certain types of enemies. It feels like Starlink is urging the player to continually swap out wings and weapons, even if their instinct is to find one loadout that works and stick with it. As a result, players like myself may come to rely on a particular setup they know isn't ideal just to avoid constantly switching to different gear. All of this potential difficulty with regard to customization is only compounded by Starlink: Battle for Atlas' physical component. If desired, players can go out to stores and buy small-scale replicas of ships, wings, weapons, and pilots that can be deployed in-game through use of a controller attachment. The toys themselves feel great: they're very detailed, pleasingly hefty, and in the case of ships, surprisingly large — large enough to easily dwarf the controller. They are somewhat expensive, but they certainly don't feel shoddy. Researching lifeforms is just one of several available side activities. The problem, for me at least, is that all ship and weapon customization is easily accomplished through in-game menus. And, as I said earlier, it wasn't long before I reached a point in the game when I'd sooner use ineffective gear than lose a few seconds here and there swapping out gear. Aside from its value as a novelty mechanic, I can't imagine getting into a firefight only to pause the game and start rooting through a collection of toys to find the gun I need to use — let alone being pleased by the process. This notion only seems worse considering that Starlink urges players to use as many ships, wings, and weapons as possible. If their loadout is in constant flux, players never really have the chance to become attached to specific components, so why keep physical representations of those components lying about? It's not like the physical toys offer any exclusive components, either — at least not yet — so there's really little need to have the toys at all, especially if players opt for the Deluxe version of the game. It's entirely possible that I just don't get the whole toys-to-life thing. The idea of owning collectibles that offer in-game benefits sounds fine and dandy, but swapping ships and weapons and wings out on the fly feels like a novelty at best. It seems like the development team understood that the toys-to-life mechanic might be divisive, too, as the game looks to have been designed in such a way as to allow players completely ignore the physical side of the experience if they so choose. Maybe that's a good thing. 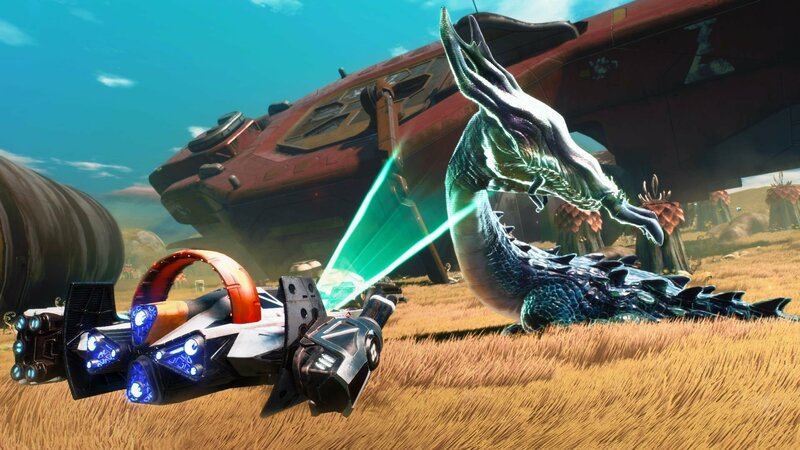 Regardless of whether or not players choose to buy into physical ships and components, Starlink: Battle for Atlas serves as a fine action adventure video game. The graphics are great, flying feels smooth and effortless, and combat and exploration are delightful, both on-planet and off. The underwhelming mission variety and tremendous amount of customization options may put some players off, but the ones who stick with with the title will be treated to a polished space-based shooter with enough content to keep them busy for the foreseeable future. This review is based on a PlayStation 4 download code provided by the publisher. Starlink: Battle for Atlas is available in retail and digital stores for $59.99, with toy starter kits that include the base game available for $74.99. The game has been rated E for Everyone 10+ by the ESRB. Recently freed Atlas from the Legion. The Digital Deluxe version is the way to go if only for cost. You really need one of each element (fire, ice, gravity, stasis... kinetic not so much) in order to properly be able to fight the big bad and even most of the planets (gravity attacks mix great, but by the end of the game most planets are about 1/2 gravity bad guys meaning they're resistant, also, there's only one counter weapon (the stasis gun). It's a good start to the game, although I feel like a lot of content was cut at some point (characters show up in cutscenes you've never met, etc.) and the enemy variety is a bit lacking. A sequel with more enemies and mission types and enemy types would be great. There's no enemy type on the planets that you benefit attacking from flying around more than being on the ground, where are my chases and dog fights through a canyon? It's a number of good ideas that aren't quite realized all the way I think. So this game is toy based right? Is there a way to play it well without buying the toys? The digital version is a much better deal for a number of reasons (Biggest being you don't actually have to physically swap this stuff out, second biggest being the immense price disparity). I had some eShop cash so I bought the digital deluxe version on Switch and had everything for $80. The standard digital version runs for $60 and comes with like 4x as much stuff to swap out as the physical version does. There is no need to buy any of the physical toys if you buy the digital versions as you can buy the rest of the stuff digitally at half the cost. If you buy everything physical separately it's like a $200 investment. unless you really want to get an arwing, I'd just go with the digital version. Yeah, I wish it was purchasable separately. Nice, I was wondering where the shack review was for this...been crickets around here since it came out. I had a blast playing through with Starfox and might replay it with another pilot/ship at some point. Best space game on Switch right now. Yeah... I kinda went overboard with Starfox and ended up way overleveled with him at the end of the campaign and his side-mission. End boss is really easy when you're constantly critting at 20k+ damage. Haha, yeah I did the same...maxed out Starfox, his ship and 4-5 weapons. Also, had a ton of epic mods and stuff. I'll definitely bump the difficulty up all the way next time. I'm having a ton of fun with this game! Last night I passed on playing more RDR2 to sink a few more hours into it. I think I'm in the main meat of the 'loop' (beat extractors->beat primes->beat dreadnoughts) which I could see getting repetitive at some point, but so far it hasn't overstayed its welcome. I'm playing it on the Switch, and I will say that it is one of the few games that look noticeably worse when played in handheld mode. Do be wary that it doesn't seem like the Dreadnaughts come back, but the Dreadnaughts will spawn Primes. Although that might be a bug in my version. Yeah I killed those too. According to Reddit they are on an invisible timer for when they’ll respawn but they’re supposed to not stop. I watched my gf beat it but I’m still 100% worlds before I head to the final fight. Recommend starting at hard / very hard from the get go. Game is way to easy, though some strats for outlaws on very hard are boring as hell. ^this is true, at worst start on Normal but change it to hard as soon as you get off the first planet.